Our custom backpacking trips into Yellowstone National Park are specifically designed to fit your group desires, fitness, schedule, and interests. 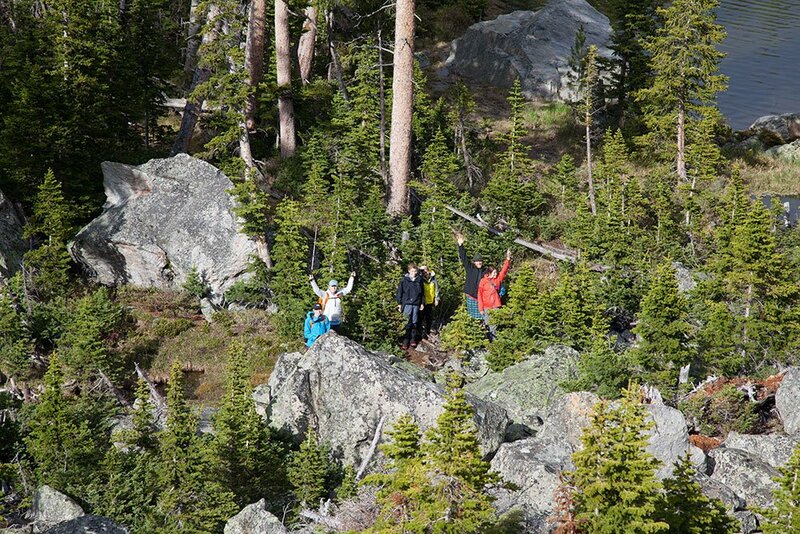 A backpacking trip in Yellowstone is an unforgettable trip and a must do if visiting Montana. We make it easy to make your trip happen; you pick the dates, we discuss your “dream trip”, then we custom design the best option. All you have to do is show up with clothing and basic gear (see gear list) ready to experience one of most remote wilderness areas in the US. We handle all logistics so you don’t have to. On all of MAG’s backpacking trips into Yellowstone we have backpacking gear available for rent if you don’t want to travel with your own backpacking gear. The sky’s the limit on backpacking choices, from easy to rigorous, river valleys to mountain ridges, minimal elevation gain to early dawn starts on peak ascents. Whether you are looking to relax in shangri-la-esque campsites, summit as many peaks as possible, gather photos, learn new skills, see wildlife, fish, etc., we can arrange the perfect balance for you and your group. On our backpacking trips with families or folks that are new-to-the-outdoors we tend to hike a short ways and set up a “base camp”. This keeps the miles to a minimum with heavier loads while having options for day trips with a light 5-10lb pack. Other trips options include loops, through hikes, team building, outdoor education and skill building, etc. River crossing shoes that double as a camp shoe. (Crocs, Keens, etc.) Should be light weight. Socks: 2 to 3 pairs (synthetic or wool-mix). Sized for your boots. At least one thin liner recommended for blister management. Misc. items: lighter, knife, camera, bandana, hand sanitizer, washcloth, etc. Pack cover or large garbage bag to line interior of pack to keep gear dry in rain storms. Snacks/Lunches for each day: a mix of sweet and savory items. In the end you have to like it to eat it, so bring what you like, but think about weight vs. caloric value. Drink mixes: optional but if it helps you hydrate; bring it. COLD WEATHER CONSIDERATIONS: Early and late season trips (June and late August-Sept) require warmer clothing. NOTE: A POUND IN YOUR PACK IS A POUND ON YOUR BACK! Attempt to shed every pound that you can. The lighter your load the more you will be able to enjoy yourself. On top of all the gear on this list you will be expected to carry, your share of the group food and cookware, tent, and water bottles (full). 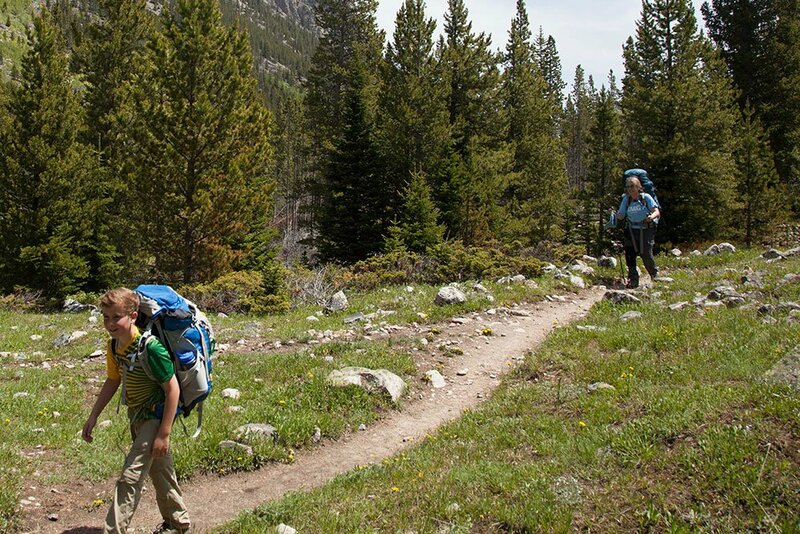 Pack weight estimates are between 35-60 lbs, depending on trip length and objectives. *** PORTERS ARE AVAILABLE *** Please call or email for details. 2 days / 1 night minimum, up to 7 days / 6 nights. Any locations further than 1 hour from Bozeman require a minimum trip length of 3 days / 2 nights or that monetary equivalent. All backpacking trips are within Yellowstone NP. 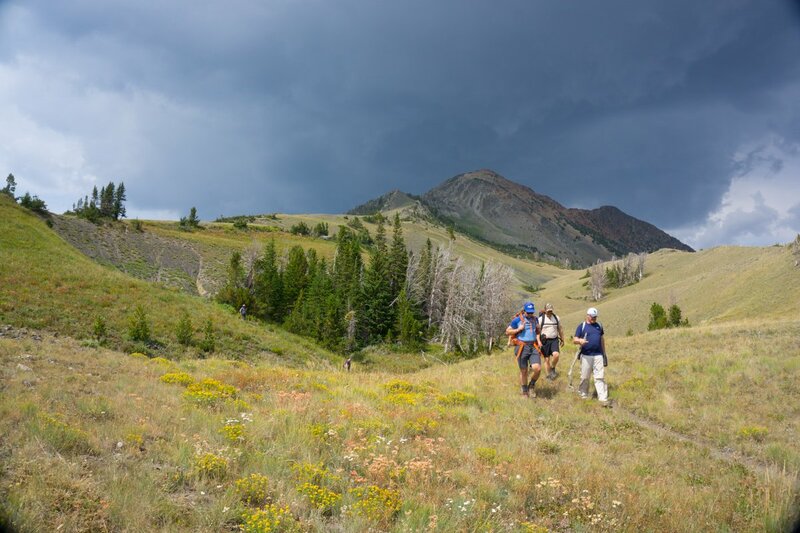 Trailheads and starting points range from 20 minutes to 1.5 hours of Big Sky & Bozeman, MT. NOTE: Prices do not include the 3.5% land use charge that we later pay directly to Yellowstone NP. There is no sales tax in MT or WY. Experienced guides with medical training and emergency communication devices, tents, meals, cookware, stoves, fuel. Transport to trailheads, personal clothing & camping gear (See Gear List). Transport can also be arranged with local taxi services. Sleeping Bag (w/ liner), sleeping pad, backpack, personal food bowl, spoon, and mug.